The Malaysian island of Penang has everything from endlessly tempting restaurants and hawkers’ stalls, to colourful street art, glitzy resorts and remnants of war. First a confession: Penang beat us. It absolutely did. My family are noted food lovers – we like to eat, and food is a highlight of just about any holiday we take. By the final night of our stay, we were over-stuffed and over-done. For dinner, my husband and I half-heartedly shared an entree of pita breads and mixed dips. Our teenage son nibbled on half a cheese pizza. Despite our aching stomachs, however, this delightful Malaysian island had won us over. From historic George Town, with its street art and rows of slightly faded grand mansions, to the resort glitz of Batu Ferringhi, there’s plenty of keep visitors busy as well as thoroughly nourished. The island’s No.1 attraction is – apparently – Penang Hill. Its peak, 833 metres above sea level, offers magnificent views and respite from the ever-present humidity. It is reached by a funicular railway that is said to be the world’s steepest train track. Unfortunately for us, the railway – and adjacent hillside walking track – were closed for maintenance during our visit. Which meant we couldn’t walk off all that food, even if we’d wanted to. We opted instead for scenery with a dose of culture, and headed for Kai Si Lok, Penang’s largest Chinese temple. It’s an incense-laden sensory treat with lovingly tended gardens, room after room of worshipping space, and views across the suburbs below. We followed up the culture blast with unforgettable history at Penang War Museum, on the site of a former British fort in the island’s south. The fort was overrun by the Japanese in 1941, and they remained there until the end of World War II. After that – dubbed “Ghost Hill” by locals, thanks to its gory history – it lay abandoned for 60 years. It re-opened as a museum in 2002, and is still being restored. It’s an unparalleled experience: Walk through the tunnels used by soldiers and prisoners, stand in their barracks, see the fortifications intended to help defend Penang. Stand where they stood and get at least an inkling of the horrors that have occurred here. War history aficionados might like to follow up with a visit to Fort Cornwallis in George Town, which dates from 1810. From here, it’s an easy – if sweaty – stroll to the oldest part of George Town, the first British settlement in South-East Asia. This cluster of historic streets has hundreds of years of history as a settlement for Malays, Chinese and Indians, and was declared a world cultural heritage site in 2008. Walking is the best way to take in the cultural mix. If the heat and humidity get too much, however, hail one of the many trishaws. 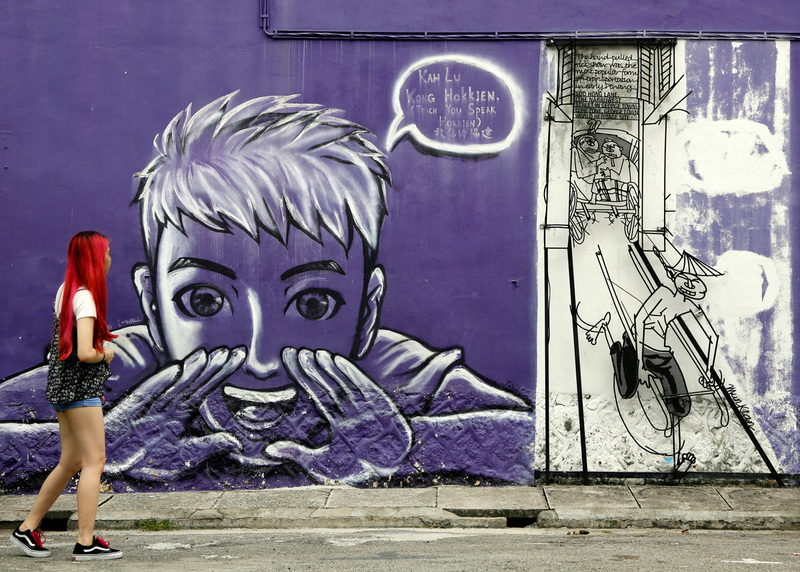 More recently, George Town has also become South-East Asia’s street-art hub. Many of the most famous works date back to 2012, and were done by Lithuanian artist Ernest Zacharevic, who was commissioned to paint public artworks to help raise the city’s international profile. Zacharevic’s most famous piece, a girl and a boy riding a real bicycle on Armenian Street, is now a tourist destination in its own right. There are also myriad other public artworks scattered throughout the streets – the delight is in discovering them all. By day, there are hawkers’ stalls everywhere. The action picks up even more at sunset when many streets close to traffic to be taken over by hawkers’ wagons. 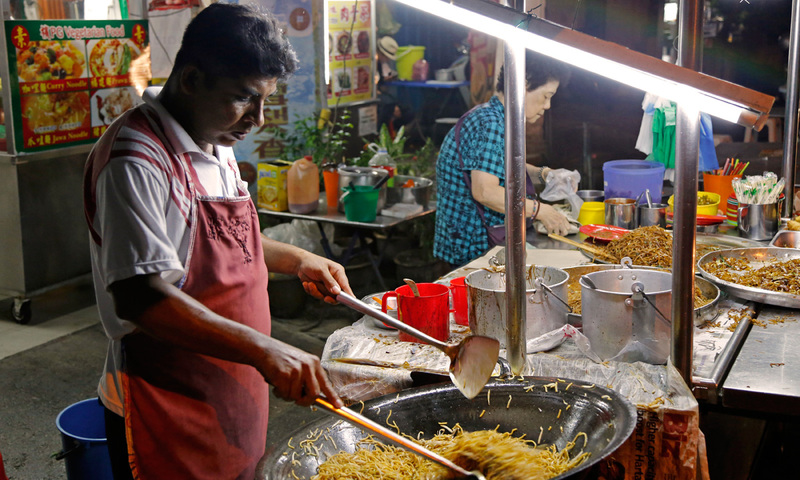 The food is a delight – grab satay sticks from one stall (six for about $1), follow up with samosas (three for $1) from another and finish with local fried flat noodles (char kuey teow, $4). You’ll really be spoilt for choice in the travellers’ mecca of Chulia Street. Come here to buy an English-language novel or book a day trip, and stay for breakfast, lunch and dinner. A block or two away, in Campbell Street, Hameediyah Restaurant is said to serve the best murtabaks in Penang (we might argue Restoran Kapitan in nearby Little India gives it a run for its murtabak money). These roti-like, omelette-y stuffed breads are a delicious meal in themselves. If the need for home comforts strikes, head for funky Two Buns, on the corner of Carnarvon Street and Lebuh Melayu, for burgers, fries and milkshakes. Like most places on Penang, especially those that cater to Western tastes, Two Buns also serves the local Tiger beer (for about $5). Here, it’s bolstered by a selection of slightly pricier imported brews and an ever-changing curated array of craft beers. As well as the best – seriously – ginger beer ever: Rudy’s Ginger Beer is an ice-cold sweet and spicy treat that’s worth the five-minute wait for it to pour and settle. When the sun finally starts to dip over the horizon (and the need for cocktails perhaps strikes), there are plenty more options. But the best sundowner view out of town is at Bora Bora by Sunset. It’s down an unassuming lane behind the shuttered market stalls of Batu Ferringhi. Once you get there, though, Bora Bora has its own delightful stretch of beach and easy, breezy service – and a generous menu of cocktails that will cost about the same as a cheap (and maybe nasty) glass of white wine. At first glance, it looks like you will need to choose between the resorts of Batu Ferringhi and the history and culture of George Town. But Penang is not that big, and has excellent roads and transport links, so you can have the best of both its worlds. Choose beaches and sunset dining and you’re still only 40 minutes by car or bus from UNESCO glory (and vice versa). Batu Ferringhi will best suit those who enjoy resorts with the trimmings – Golden Sands, Hard Rock Hotel are examples. George Town has its share of comfortable Western-style hotels – try Hotel Jen Penang and Le Dream Hotel. But location is crucial here – if you want to enjoy the delights of old George Town, choose a place that doesn’t require too much walking to get there. Penang is hot and steamy, day and night. Another option in George Town is one of the array of shop houses that have been converted into boutique hotels, such as Seven Terraces or Cheong Fatt Tze. These are often decorated in traditional style but come with modern trimmings. Most places will throw in breakfast and many also have free cocktail hours. Penang is just five degrees north of the equator, so expect warm and steamy weather whenever you go (fortunately, air-conditioning is widely available – and effective). Average day-time temperatures range from minimums of about 23 degrees to maximums of 33 year-round. It is wettest between August and December, and driest in January and February. Because it is close to the equator, daylight hours also vary little throughout the year. In January, we were surprised to find the sun rising at 7.30am. That might also help to explain the comparatively late hours kept by the locals. If you’re an early-rising kind of traveller, you’ll need to change your ways – most shops don’t open before 9.30am (shopping centres were commonly open 10am-10pm daily). Hot tip: Get around George Town on the air-conditioned and free CAT buses. These run every 15 minutes and take in all the sights – hop on and off where it suits. Second hot tip: If going further afield, sign up for Grab, South-East Asia’s equivalent of Uber. Your very own air-conditioned car will arrive in quick time and a friendly driver will deliver you direct to any destination (anecdotally, the average fare for Grab drivers in Malaysia is just 3 ringgit, or $1 – so it’s a bargain, too).